Born in 1846 in County Mayo, Michael Davitt was brought up in a poor immigrant community in Lancashire in England. Though working as a laborer from the age of 9, he managed to achieve a good education. After becoming a typesetter and then a bookkeeper, he joined the Irish Republican Brotherhood (IRB) at the age of 19, for which he became an organizing secretary. Imprisoned through the 1870s for treasonable activity, he was released in 1877 and immediately rejoined the IRB. In 1879, as famine developed in Ireland, he became a founder of the Irish National Land League, and persuaded Charles Stewart Parnell, an establishment-oriented radical member of Parliament, to become President. The two worked together, including traveling to the US on a highly successful fund raising exercise. which also led to the formation of an American branch of the Land League. 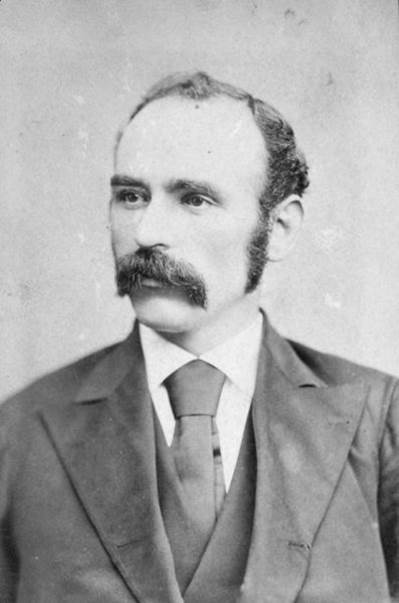 Like Parnell, Davitt was imprisoned briefly in 1882 under the Coercion Act, and on his release increasingly looked to land nationalization as the way forward. This enhanced the existing divisions between himself and Parnell, who was focusing on Home Rule and parliamentary and constitutional politics, and the Land League faltered in late 1872 to be replaced by Parnell’s Irish National League. Davitt, who was a strong supporter of the ideas of Henry George, achieved considerable status amongst American radicals during the early 1880s. However, his health was broken by his various terms in prison and he became a more establishment, rather than revolutionary, figure. In the 1890s he became a member of the British Parliament on three occasions, but never achieved the leadership status of the earlier period. This entry was posted in People and tagged Henry George, Irish World, Land League, Organise and Spread the Light, Patrick Ford. Bookmark the permalink.